Banked along Pittsburgh’s North Shore, mere walking distance from where the Ohio River meets the Allegheny, is the Steel City’s sole gambling establishment: the aptly titled Rivers Casino. And while today Rivers holds it own against its eastern PA counterparts, the young standalone casino has already faced its fair share of hurdles, both political and financial. In 2004, gamblers from the Keystone State rejoiced when the Pennsylvania Horse Race Development and Gaming Act (Act 71) was inked into law. Allowing for the installation of 61,0000 slot machines at PA’s existing horse race facilities and yet to be built casinos, the language of the law reserved at least one of the 17 issued casino licenses for the Steel City. Shortly thereafter, four gaming organizations vied for the coveted ownership position of what would eventually become Pittsburgh’s first commercial gambling facility. Initially, government officials fancied an offer from Isle of Capri Casinos, Inc. – a Missouri-based gaming veteran currently overseeing the operations of 15 casinos – as it was willing to shell out nearly $300 million towards the development of a new hockey arena. But ultimately it would be Don Barden’s holding company PITG Gaming, LLC. that would be unanimously approved by the Pennsylvania Gaming Control Board to construct a casino on Pittsburgh’s North Shore. As part of the agreement, Barden agreed to a proposed Plan B that would require the casino to delegate $7.5 million of its annual revenue take for the next 30 years towards the construction of a new arena. On December 20, 2006 the board awarded PITG a Category 2 slots license. In the aftermath, the other three candidates would all file lawsuits, forcing Barden to delay his contractors from breaking ground. Further issues developed in 2008 when Barden defaulted on a $200 million loan from Credit Suisse, prompting the lender to threaten foreclosure. Under immense pressure from state lawmakers, some of whom were calling for his license to be revoked, Barden forged a desperation deal with billionaire Neil Bluhm. As part of the arrangement, Barden and his other investors would only retain a 25 percent stake in the company, with the rest signed over to Bluhm’s firm, Walton Street Capital. The board approved the transition and development began anew. Despite the myriad of delays, Rivers Casino opened as scheduled on August 9, 2009. Rivers enjoys the unique advantage of being the only casino in the greater Pittsburgh area. Situated along the bustling North Shore, and overlooking the Ohio River, the casino is easily accessible via the West End Bridge and the 65th Infantry Division Memorial Hwy. The fabled Heinz Field and Carnegie Science Center are also located within striking distance of the gambling facility, rendering it the perfect locale for die hard Steelers fans to watch the game. Rivers revenue margins for both slot machines and table games rank in the upper echelon of all PA-based casinos. During the 2012-13 fiscal year Rivers slot machines brought in over $283.3 million in gross terminal revenue. Only Sands Bethlehem and Parx Casino, both of which feature more machines, sported a bigger take. The casino’s 2,900+ slot machines are right around average for the state. As a mode of comparison, Rivers closest competitor, The Meadows, features nearly 400 more machines yet generated significantly less revenue. Table games were first introduced to the gaming floor in mid-2010, and after an initial run produced favorable results, more were added. 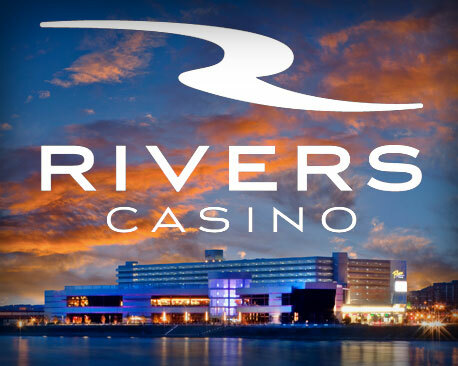 Today, Rivers showcases over 100 table games, which in fiscal 2012-13 generated an impressive $197 million in gross revenue for the casino. That was good enough for fifth place among PA casinos. Rivers revenue numbers become even more impressive when you factor in that it’s a newer, lesser known commodity, and doesn’t feature a horse racing facility. Born in 1938, Niel Bluhm is an University of Illinois at Urbana-Champaign alumni and former law practitioner. After launching his first realty company, JMB Realty, with his college roommate in 1969, Bluhm’s career would quickly take flight, rapidly propelling him to the elite status he enjoys today. Shortly after the real-estate downturn of the 1990s, Bluhm would turn his focus elsewhere. In 1994 he became a Managing Partner of private equity firm Walton Street Capital. He also owns Holdings Acquisitions Co., the same company that owns and operates Rivers Casino. In addition, Bluhm has stakes in two other casino properties: a second Rivers Casino located in Des Plaines, Illinois and a casino property in Vicksburg, Mississippi. Rivers Casino lives and dies by the breadth of its casino game offerings. In addition to more traditional forays such as blackjack and craps, the casino spreads multi-bet games like 4 Card Poker, Crazy 4 Poker and Mississippi Stud Poker. Unique to Rivers Casino are its multi-table game progressive jackpots. Linking four games together with one common jackpot Rivers, more than any other PA casino, offers its patrons the opportunity to strike it filthy rich with just a solitary flip of the cards. The poker room at Rivers Casino is often compared to that of the Venetian’s in Las Vegas. Spacious, luxurious and comfortable, the 30 table room features a slew of player friendly amenities and premium services. Sixteen weekly tournaments, with buy-ins ranging from $50 to $225, complement the room’s wealth of cash-game offerings. In addition, the room at Rivers boasts a variety of promotional events including player appreciation freerolls, cash giveaways, charity tournaments and a special Pittsburgh Penguins Alumni Poker Tournament where players can try their luck against a former hockey great. Featuring five entertainment venues and bars, half-a-dozen eateries and over 3,000 ways to gamble it up, Rivers Casino gears itself towards younger players, especially sports junkies. Factor in its proximity to Heinz Field and other popular locales and it comes as little surprise that Rivers Casino is holding its own against PA’s gaming heavyweights. That being said, Rivers is not without its drawbacks. The casino does not offer free drink services, and outside of its thriving bar scene and magnificent poker room, the casino does little to differentiate itself from Pennsylvania’s other gambling playgrounds. Compounding matters, some opponents of the casino claim that it causes unnecessary traffic bottlenecks. But what Rivers lacks in standout features and convenience it makes up for in comprehensiveness and its unique distinction as the only casino in the Pittsburgh area.